Department of Information Technology has been started in 2001 and presently running with intake of 60. Department is accredited by National Board of Accreditation (NBA), New Delhi in 2012. Department has 12 advanced well equipped laboratories, Seminar Hall, Tutorial halls and experienced dynamic faculties including doctoral faculties. Apart from regular curriculum, excellent results and good placements, department also focuses on strong interactions with industries, Foreign universities, IITs and government departments. 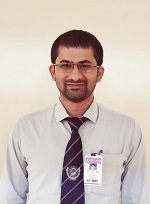 Dr. Samant Khajuria, Aalborg University, Denmark, Hon. 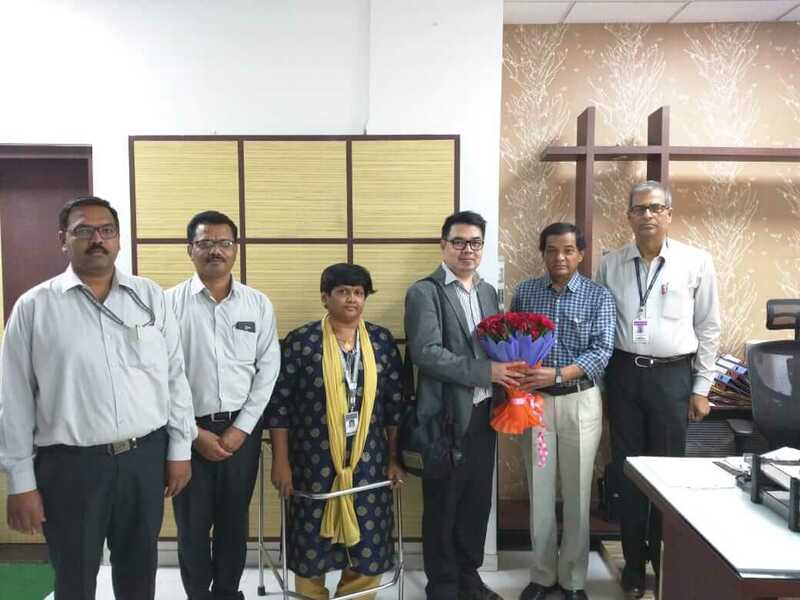 Tomio Isogai, Japan with his team, Dr. Shashi Kelkar, Former adjunct faculty of IIT, Powai, Hon. 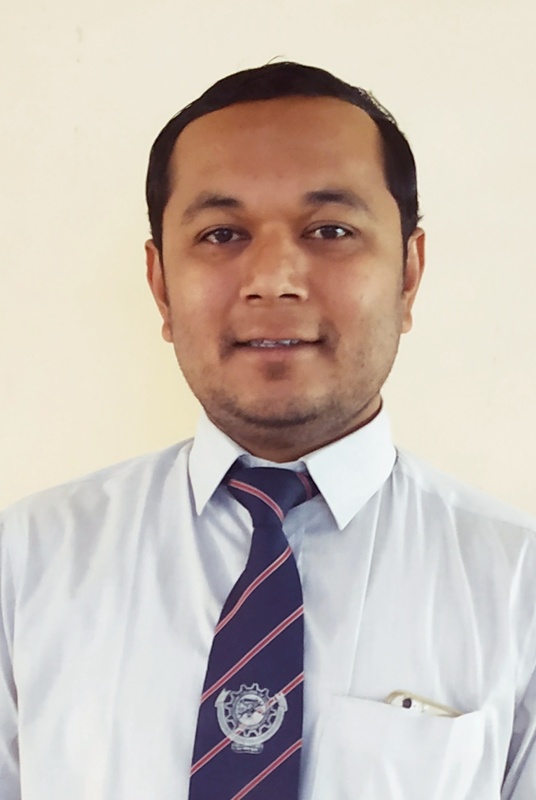 Raj Desai, CITARA Team of IIT Powai, Hon. 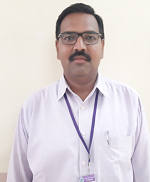 Pravin Kolhe, Executive Engineer, Pune Irrigation department, government of Maharashtra, Hon. 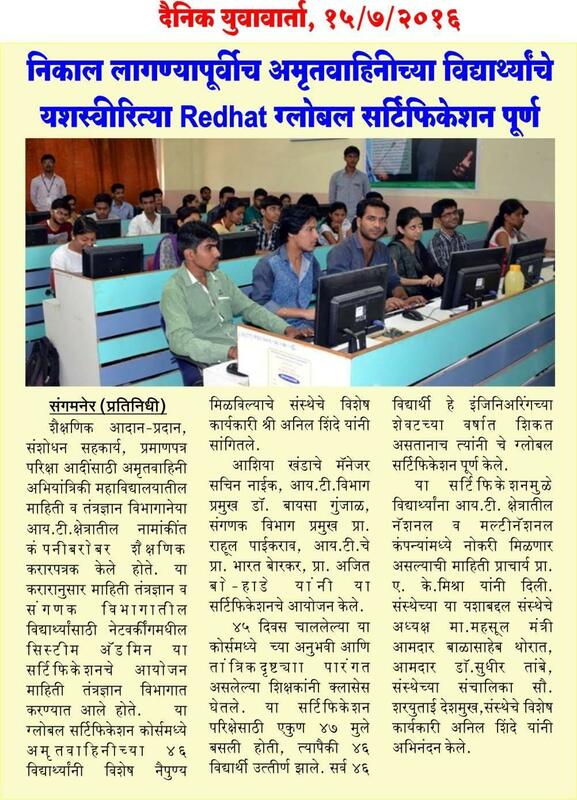 Sunil Patil, Inspector Cyber Crime Cell Ahmednagar district recently visited department and guided our students. 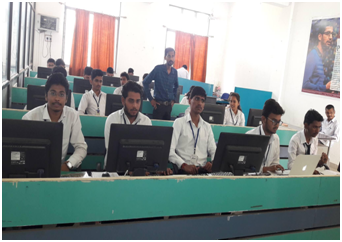 Department has advanced facilities such as REDHAT Certification Centre, CCNA (Cisco Certified Network Associate) Cell, Competitive Exam Cell, Centre of Excellence for Android Project Development, I.T. Online Certification Cell, Department National Programme on Technology Enhanced Learning (NPTEL) Study centre, Open source Lab and many more. 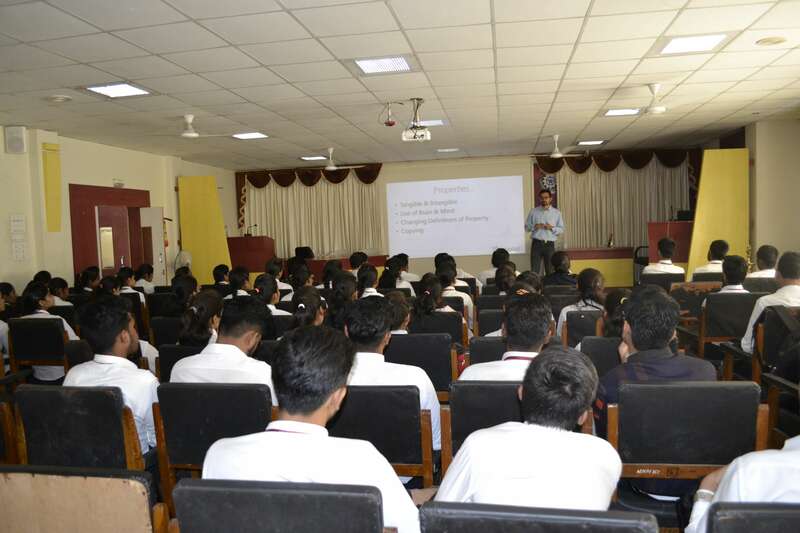 As per industry need various value added courses such as android training, Advanced Java training, Big Data, Web development trainings, and Cyber security certification, RED Hat certification and CCNA certifications are conducted in department by industry experts. Under umbrella of the institution department offers Japanese and German language courses. 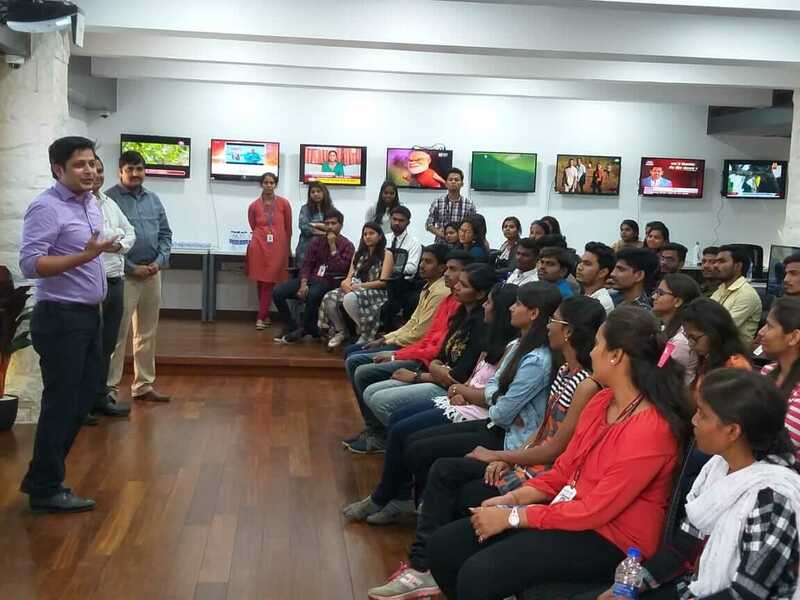 Department regularly organizes industrial visits to reputed industries such as Tata Consultancy Services(TCS) Pune, Reliance Infra Dahanu Mumbai, TCS Innovation Center Nashik, C-DAC Pune, BancBridge Aurangabad, Winjit Technologies Nashik, BSNL Ahmednagar and Science Park, Pune, many more. 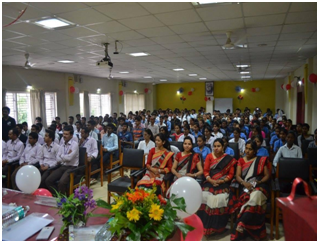 Department invites senior-alumni from reputed companies for regular interaction with students. 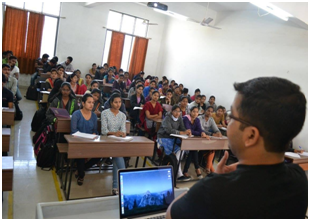 Our students are placed in reputed companies including Microsoft, TCS, Cognizant, IBM and many more. 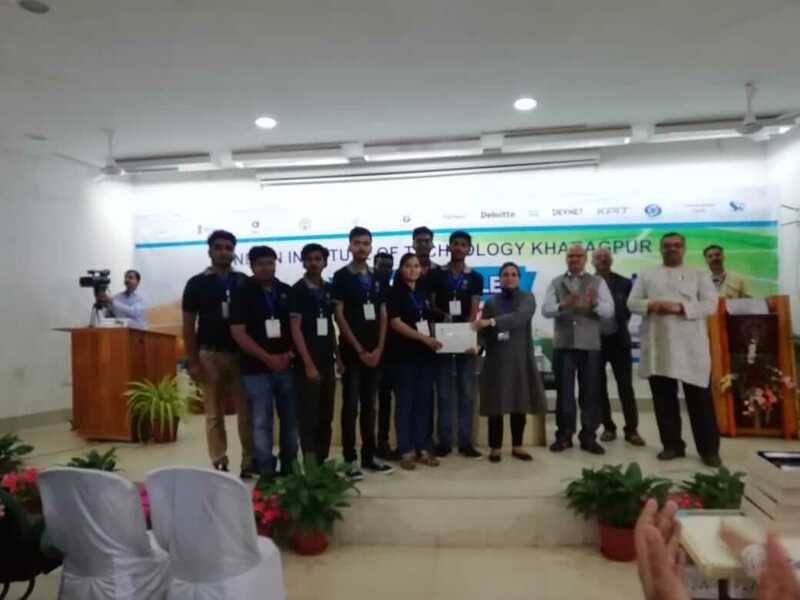 Apart from this department organizes carious activities under Society of Information Engineering Students (SITES), Professional society chapter of Institution of Engineers (India) and Phonix club of the department. Department strongly believes that “Excellence is an continuous process and not by accident…!!!”. 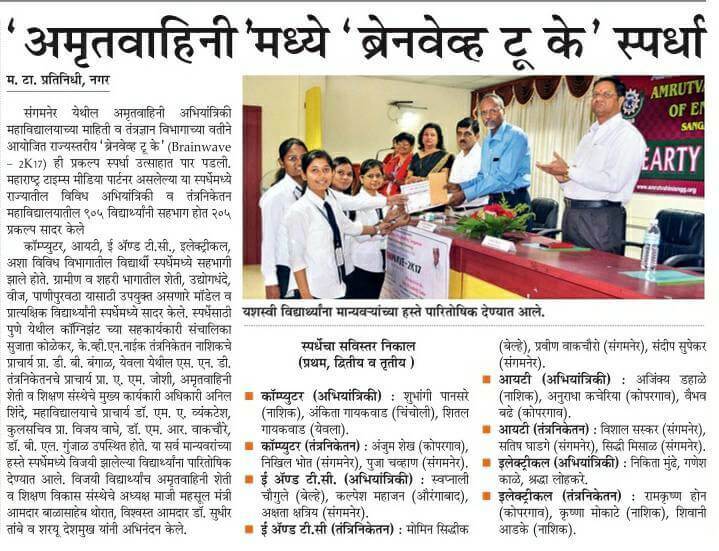 To transfer the rural learners into competent I.T. engineers and technocrats in emerging areas of I.T. 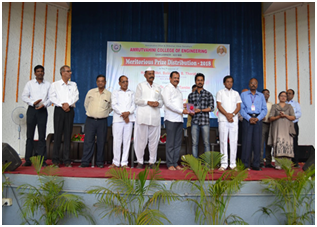 Engineering education through continual excellence for the benefit of society. Mission of Information Technology Department is elaborated in following three mission statements. M1: To empower the youths in rural communities to be self-disciplined, physically fit, mentally robust and morally strong I.T. professionals. M2. To provide cutting-edge technical knowledge through continuous process in rapidly changing environment as per need of industry and surrounding world. M3: To provide opportunities for intellectual and personal growth of individuals in rural platform using high quality Information Technology education. 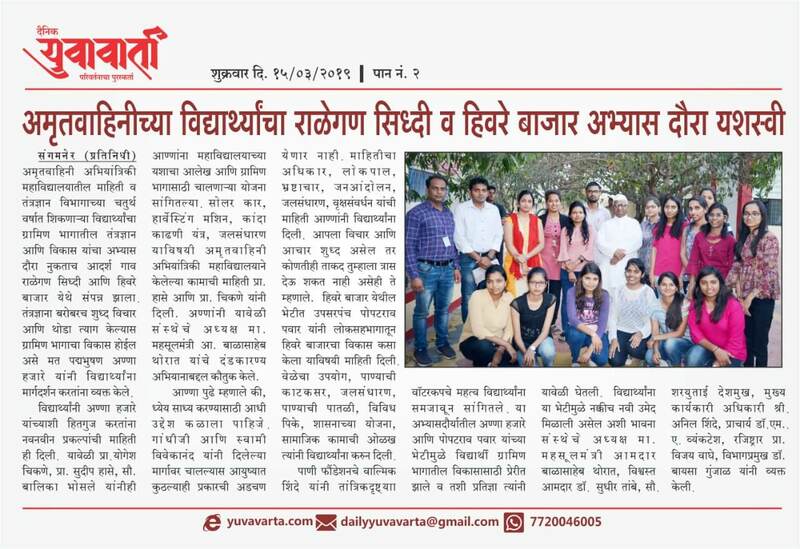 Appreciation of Mr. Rahul Kadam & group and Ms. Pratikha Dushing & group for national event award. 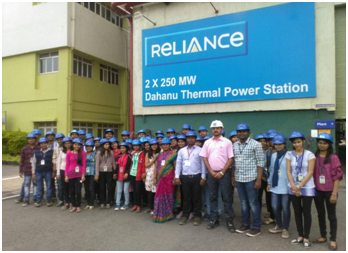 Industrial Visit at Reliance Infra, Mumbai. Name : Mr. Tambe B. S.
2. Dr. M.A. 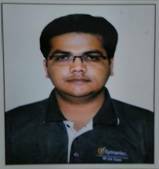 Chaudhari Awarded Ph.D. degree in June 2016 from NGBU, Allahabad. 3. 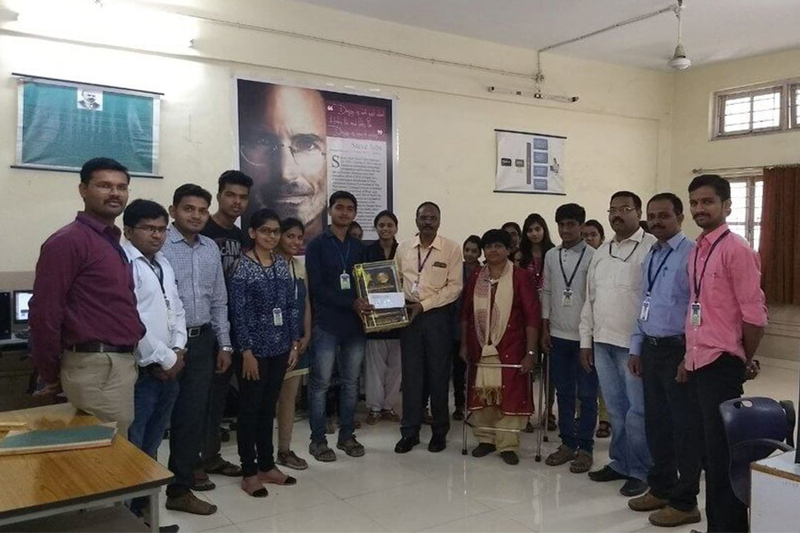 Prof. R. S. Bhosale Received appreciation award from IEI, Ahmednagar on Engineer’s day function. 4. 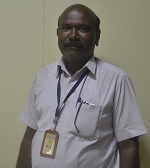 Prof. A. R. Panhalkar Received lady engineer award on 15th September, 2015 by Institution of Engineers (INDIA). Baisa L. Gunjal, “A Classical Review of Advanced Digital Image Watermarking Techniques”, International Journal of Research Publications In Engineering And Technology [IJRPET], ISSN: 2454-7875, Vol 3, Iss. 8, pp. 58-65, Aug. 2017. IJRPET, Vol 3, Iss. 8, Aug. 2017. Baisa L. Gunjal, “Fun with digital image processing`in PHP on Windows and LINUX platform”, Computer Society of India Communications(CSIC), ISSN:0970-647X, Vol 41, Iss. 9, pp. 36-39, Dec. 2017. http://www.csi-india.org/Communications/CSIC/CSI%20Communications%20Dec%202017.pdf Communications(CSIC), Vol 41, Iss. 9, Dec. 2017. 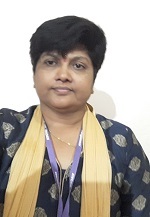 Baisa L. Gunjal, “Essence of management skills in technical communications”, Computer Society of India Communications(CSIC), ISSN:0970-647X, Vol 40, Iss. 5, pp. 22-29, Aug. 2016. [Online] Available: http://www.csi-india.org/Communications/CSIC_Aug_2016.pdf Communications(CSIC),Vol 40, Iss. 5, Aug. 2016. S.N. 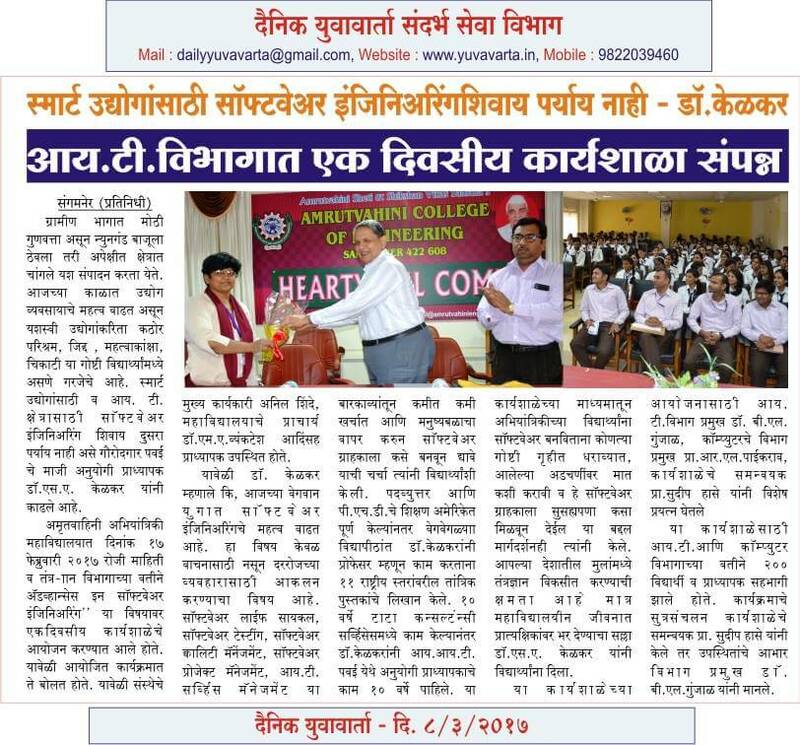 Patil, B.S.Borkar, R.N. Muneshwar, “M-Healthcare Cloud Computing System for Multilevel and Single Handled Privacy Preserving Cooperative Authentication in Patient Diagnosis", International Journal for Scientific Research & Development [IJSRD],Vol.5, Iss.1, pp.988-991, 2017. IJSRD,Vol.5, Iss.1, 2017. 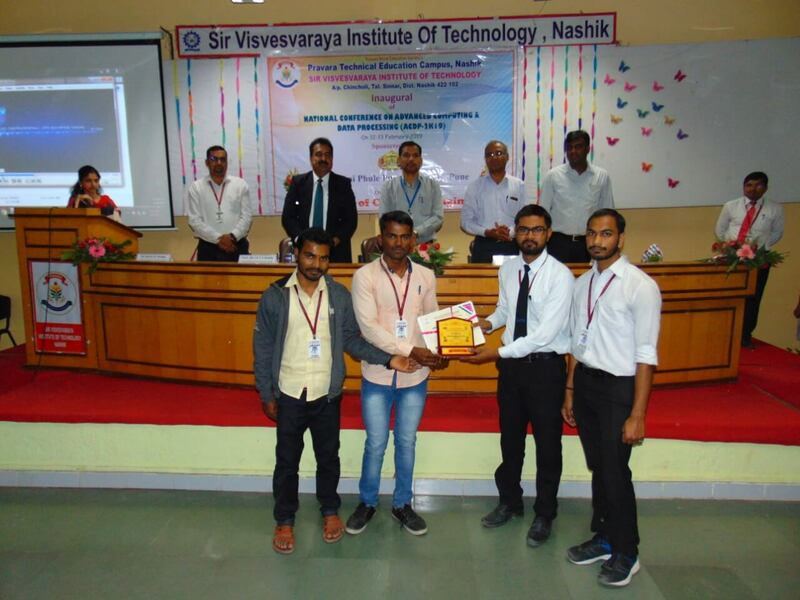 Anand K. Hase, Priyanka S. Aher , Sudeep K. Hase, “Detection, categorization and suggestion to cure infected plants of tomato and grapes by using OpenCV framework for andriod environment” IEEE 2nd International Conference for Convergence in Technology (I2CT) in Mumbai, India, 7-9 April 2017. https://ieeexplore.ieee.org/document/8226270/ DOI: 10.1109/I2CT.2017.8226270 IEEE Explorer, Apr. 2017. P.G. 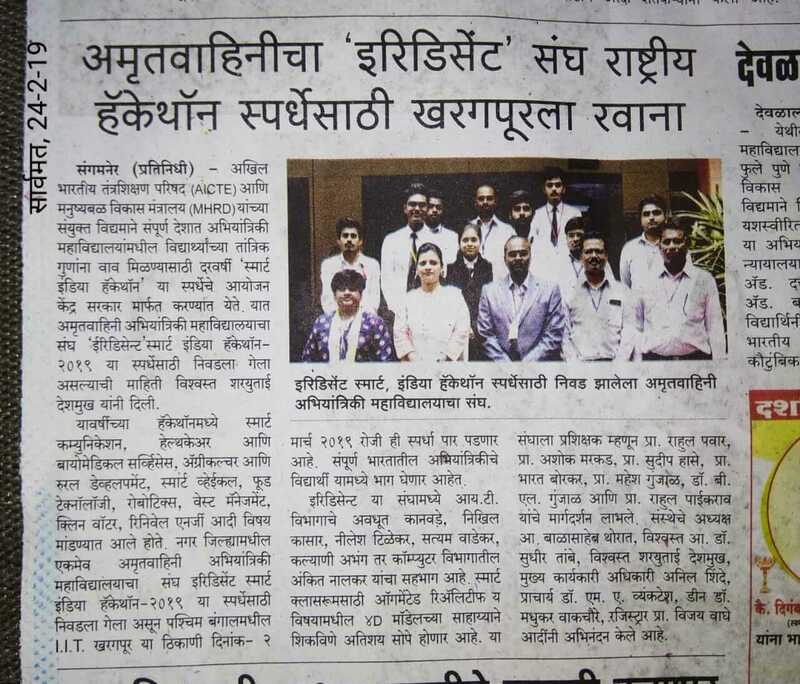 Dhavane, D. R. Patil,“Survey: A virtual field of science and technology in learning process ”, IEEE International Conference on Global Trends in Signal Processing, Information Computing and Communication (ICGTSPICC) at Jalgaon, India, 22-24 Dec. 2016. DOI: 10.1109/ICGTSPICC.2016.7955357 IEEE Explorer, Dec. 2016. Baisa L. Gunjal et al, “Effective Secret Communication using scarmbling Techniques”, Computer Society of India Communications (CSIC), ISSN:0970-647X, Vol 39, Iss. 8, pp. 38-39, Nov. 2015. 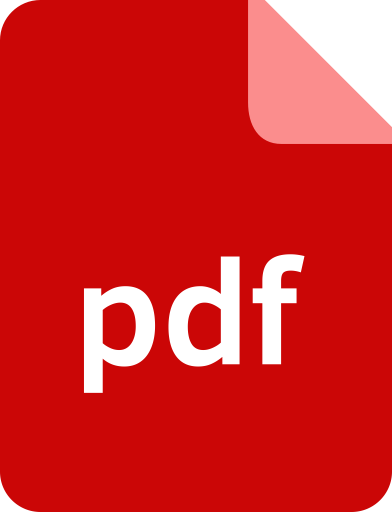 [Online] Available: http://www.csi-india.org/digital_magazine/November/Nov.pdf Computer Society of India Communications (CSIC), Vol 39, Iss. 8, Nov. 2015. Kranti N. Gule, Rohit N. Devikar, Sudip K. Hase, “A Survey Paper on Wireless Authentication in ATMs Using GSM Technology”, International Journal on Emerging Trends in Technology(IJETT), Vol.2, Iss.2.pp.353-357 September 2015. IJETT,Vol.2, Iss.2. Sep. 2015. Rohit Nilkanth Devikar, Dipak V. Patil and V. Chandraprakash, “Issues in Routing Mechanism for Packet Forwarding : A Survey”,International Journal of Electrical and Computer Engineering (IJECE), Vol. 6, No.1,pp. 421-430, February 2016. IJECE, Vol. 6, No.1, Feb 2016. Rohit Nilkanth Devikar, Dipak V. Patil and V. Chandraprakash, “A Mathematical Approach to Improve the Network Performance”, Indian Journal of Science and Technology, Vol 9, Iss.2, pp.1-8,January 2016. DOI: 10.17485/ijst/2016/v9i2/76183 IJCT, Vol 9, Iss.2, Jan. 2016. Pranita H. Mokal, R. N. Denikar, “A Three Level Graphical Password Scheme for Providing High Degree of Security”, International Journal of Science and Research (IJSR), Vol.5 Iss.1, pp.88-93,January 2016. IJSR, Vol.5 Iss.1, Jan. 2016. Pranita H Mokal and R. N. Devikar, “A Click Based Graphical Password Scheme Using AI Hard Problem”, Elixir International Journal for Network Engineering 89 (2015), pp. 37039- 37042, December 2015. Elixir, Dec. 2015. 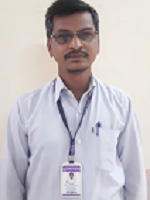 Swapna Shivaji Arote, R. S. Bhosale, “International Journal of Advance Research in Computer Science and Management Studies”, Vol. 3, Iss.9, pp.289-293,September 2015. ARCSMS, Vol. 3, Iss.9, Sep. 2015. Priya Satpute, A.R. Panhalkar, “Development of Data Transmission Mechanism in WSN using Gray Code Technique”, International Journal of Advanced Research in Computer Science and Software Engineering,Vol.5, Iss.7,pp.318-321, July 2015. IJARCSSE,Vol.5, Iss.7, Jul. 2015. 5. Ms Nikita Kulkarni Qualified NAT Q4 Japanese Certification. 6. 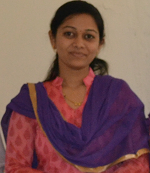 Ms Pooja Shinde Qualified NAT Q5 Japanese Certification. 1. 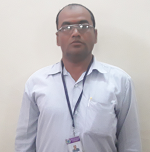 Mr. Abhijit Thorat(B.E.I.T) Selected as innovator at "Digital Impact Square TCS Innovation Center", Nashik with initial 6 months stipend of Rs 90,000/- and if selected then phase-II stipend of Rs 1,50,000/- for next 6 months. 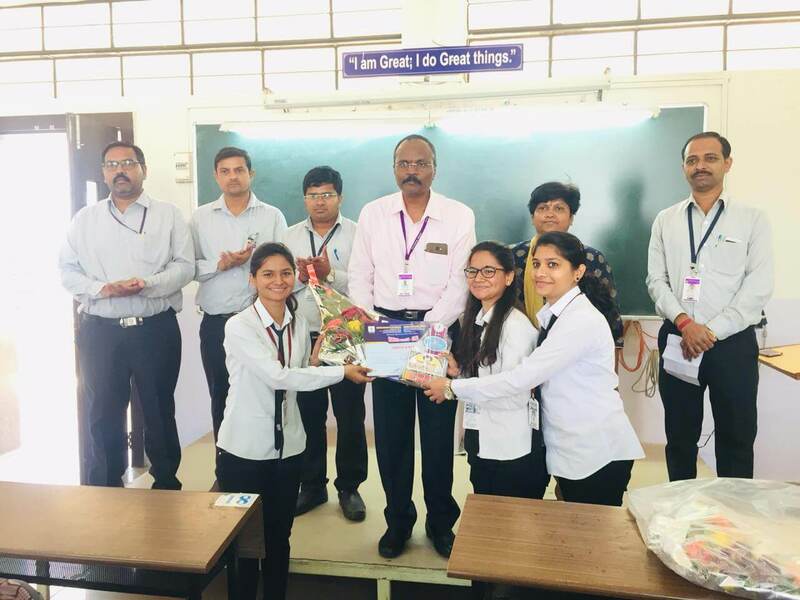 First Prize in Paper presentation in "National Level Tech-FEST 2018", organized by Sanjivani College of Engineering Kopargaon. They received “GENERAL TROPHY AWARD” with Rs: 25,000/-(Twenty Five Thousand). On the behalf of Amrutvahini COE Sangamner for maximum participation in this national event. 1. 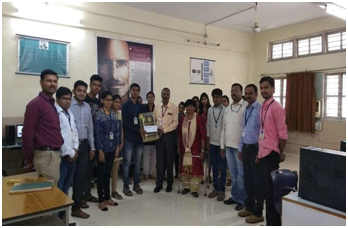 Mr. Navnath Wagh(BE-I.T) Scientific Officer of Ministry of Defence Mr. V. Ravindranath Felicitated and Congratulated Mr. Navnath Wagh for completing sponsored project under Ministry of Defense. 5. 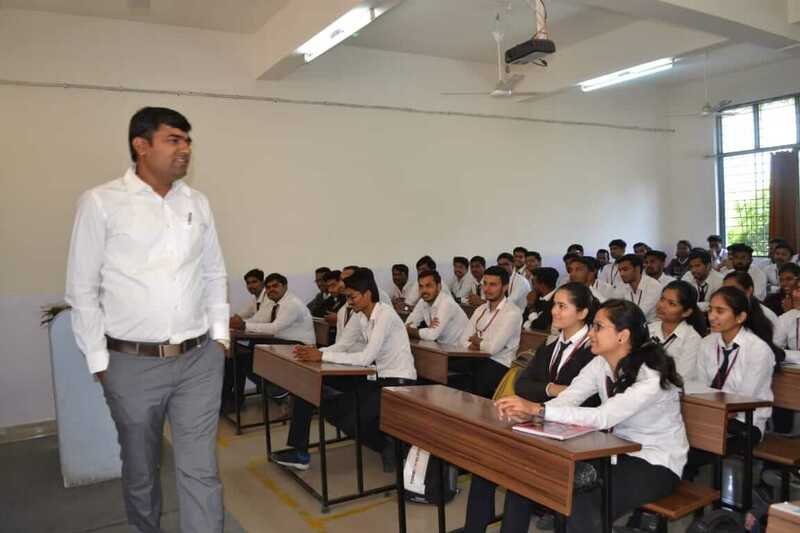 Ballota Pvt Ltd in Sinnar MIDC Prof R. B. Pawar along with Cell of Industry Institute Interaction The faculties got information about products of visited companies. 7. 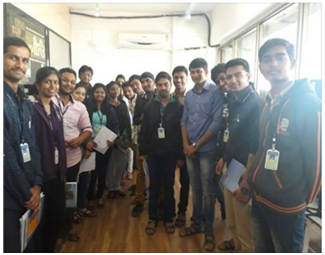 31/8/2016 Science Park, Pune SE Students studied scientific and technological approach about experiments. 9. 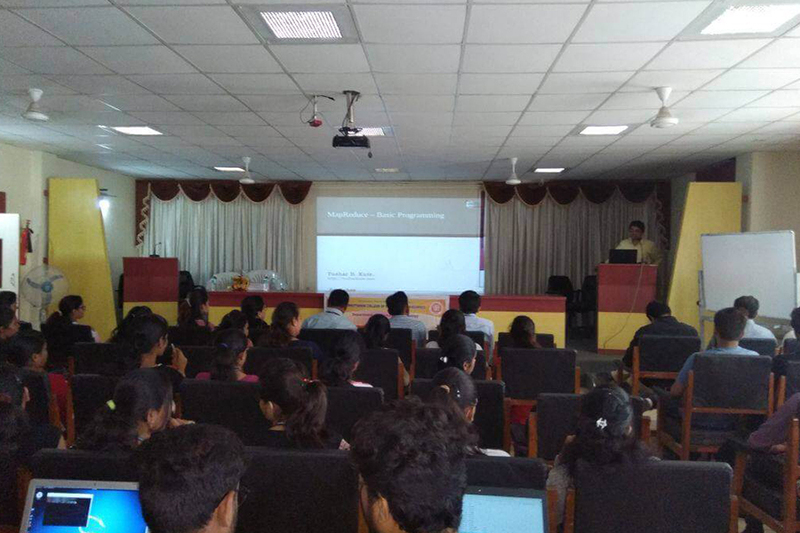 17/2/2017 Redhat, Pune TE Mr. Ajit Mote guided about open source platforms and relaed ongoing projects in Company. 11. 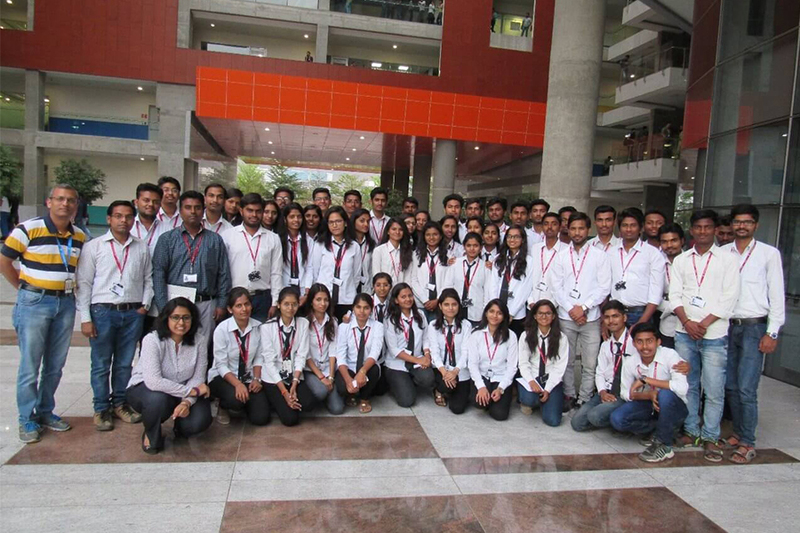 14/08/2015 Science Park, Pune SE Students studied scientific and technological approach about experiments. 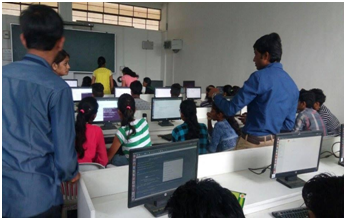 Hands on Cloud Computing Prof A.D. Gawali AVCOE Sangamner Students got practical knowledge of Cloud Base Environment. 13. 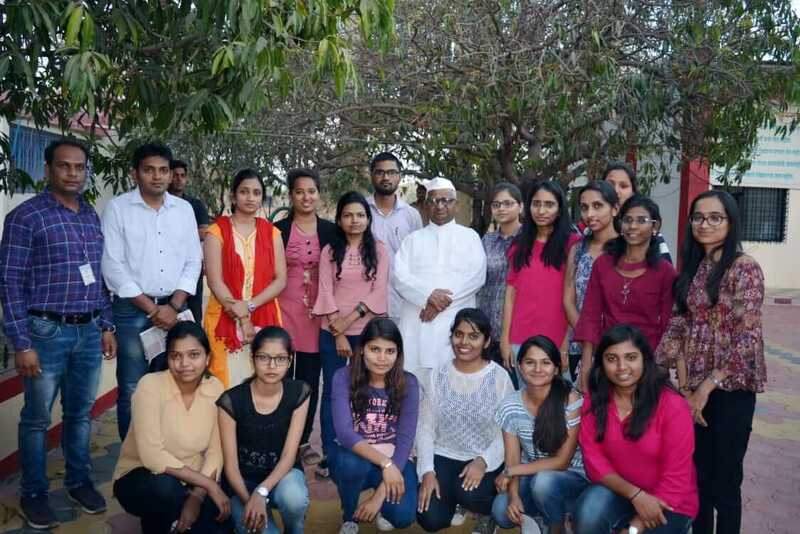 09/02/2016 Mr. Anand Shirsath,Founder of Acrete Technology, Nashik. Project Management & EDP TE & BE Students learned Project Management lifecycle. 1. 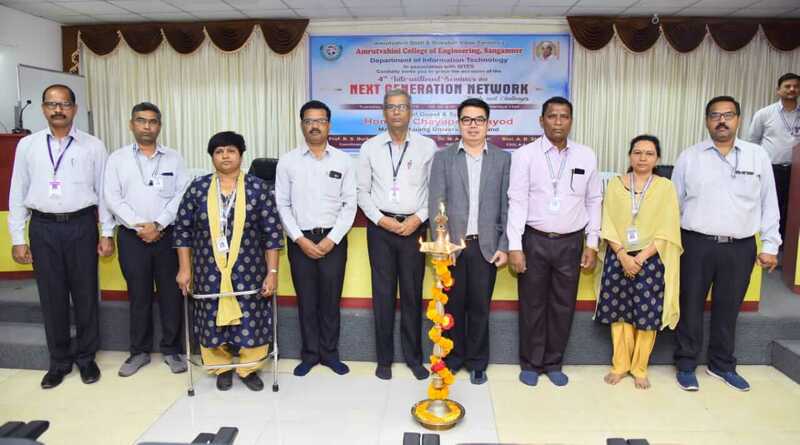 12/09/18 International seminar on "Global Demands of Big Data Analytics in I.T. Industry" Scientist Dr. Mohammad Reza BeikZadeh, Malaysia TE, BE Students learned about global demands in Big Data. 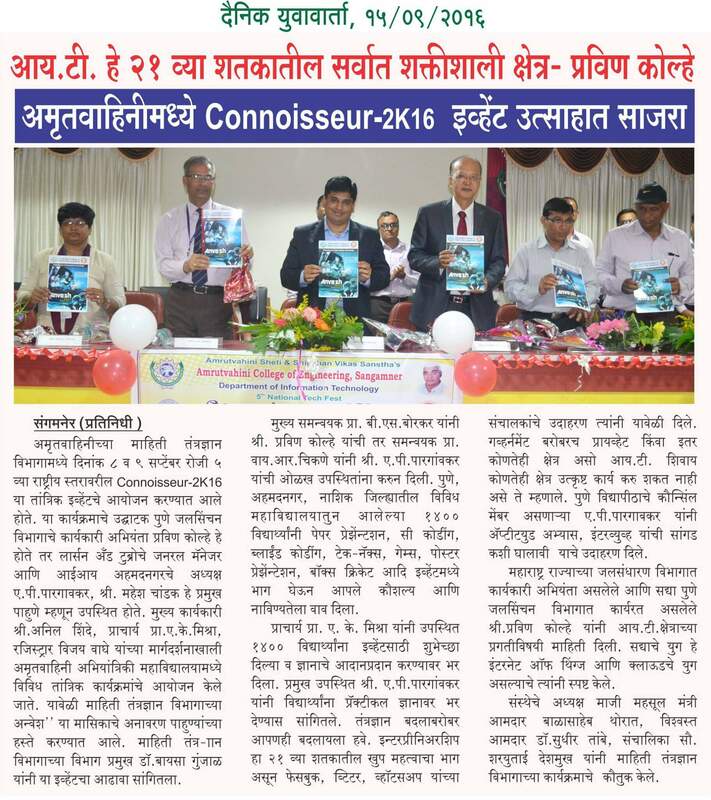 4 Prof. Bhosale R. S.
5 Prof. Muneshwar R. N.
6 Prof. Devikar R. N.
7 Prof. Devikar R. N.
8 Prof. Pawar R. B. 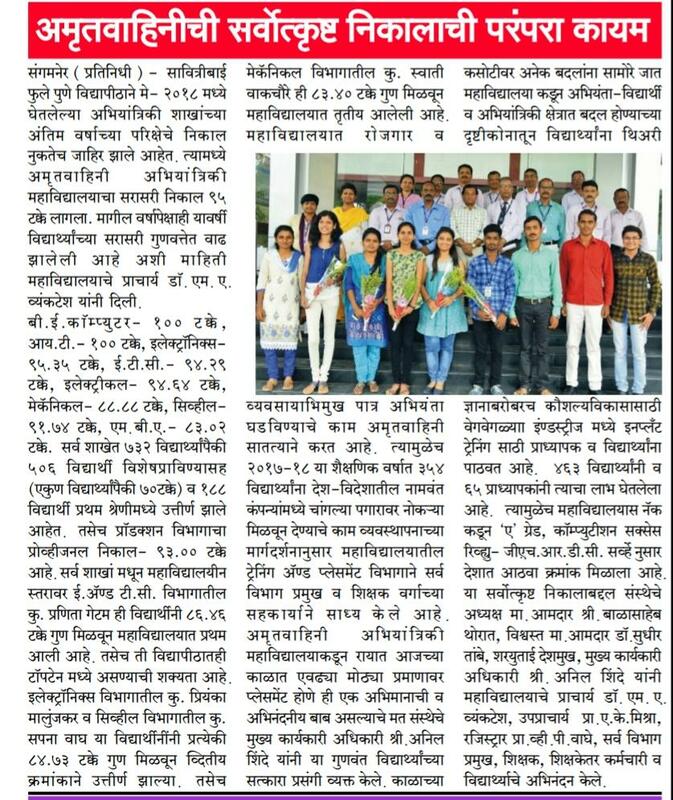 12 5/6/2018 To 8/6/2018 Four Days Industrial Training Hindustan Aeronautics Limited (HAL), Nashik Prof. Borkar B. S.
Prof. Pawar R. B. Faculties learned about services of HAL. 16 Er. Bhosale R. S.
18 Er. Patil D. R.
20 Er. 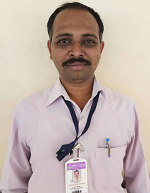 Deshmukh S. C.
21 Er. Chikane Y. R.
22 Er. Muneshwar R. N.
23 Er. Devikar R. N.
24 Er. Hase S. K.
25 Er. Borhade A. M.
26 Er. Kalmegh S. M.
27 Prof. Pawar R. B. 39 Er. Borkar B. S.
40 Er. Bhosale R. S.
41 Er. Panhalkar A. R.
42 Er. Patil D. R.
43 Er. Markad A. V.
44 Er. 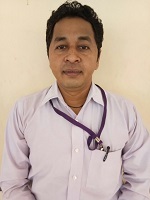 Deshmukh S. C.
45 Dr. Chaudhari M. A. 46 Er. Muneshwar R. N.
47 Er. Devikar R. N.
48 Er. Hase S. K.
49 Er. Dighe S. G.
50 Er. 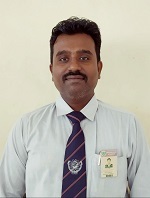 Borhade A. M.
51 Prof. Pawar R. B. 54 Er. Borkar B. S.
55 Er. Bhosale R. S.
56 Er. Panhalkar A. R.
57 Er. Patil D. R.
58 Er. Markad A. V.
59 Er. Deshmukh S. C.
60 Dr. Chaudhari M. A. 62 Er. Muneshwar R. N.
63 Er. Devikar R. N.
64 Er. Hase S. K.
65 Er. Dighe S. G.
66 Er. Borhade A. M.
67 Prof. Pawar R. B. 70 Er. Borkar B. S.
71 Er. Bhosale R. S.
72 Er. Panhalkar A. R.
73 Er. Patil D. R.
74 Er. Markad A. V.
75 Er. Deshmukh S. C.
76 Dr. Chaudhari M. A. 77 Er. Muneshwar R. N.
78 Er. Devikar R. N.
79 Er. Hase S. K.
80 Er. Dighe S. G.
81 Er. Borhade A. M.
82 Prof. Pawar R. B. 1. Prof. A.V. Markad and Prof A.M. Borhade received BCUD grant of Rs. 1,60,000/- for their security based research project. 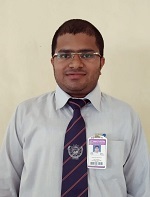 01 Sav Akshay Information Technlogy ME(CSE) Amrutvahini College of Engineering,Sangamner. 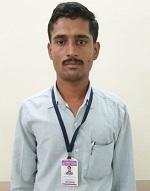 02 Deshmukh Sayali Information Technlogy ME(CSE) Amrutvahini College of Engineering,Sangamner. 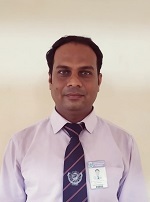 03 Shete Sharddha Information Technlogy ME(CSE) Amrutvahini College of Engineering,Sangamner. 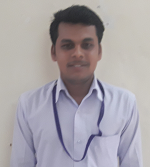 04 Shrivastav Anuksha Information Technlogy ME(CSE) Amrutvahini College of Engineering,Sangamner. 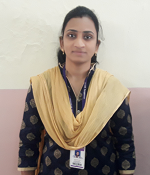 05 Sonali Satpute Information Technlogy ME(CSE) Amrutvahini College of Engineering,Sangamner. 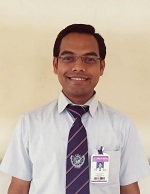 01 Mr. Santosh Rahane Information Technology ME(I.T.) 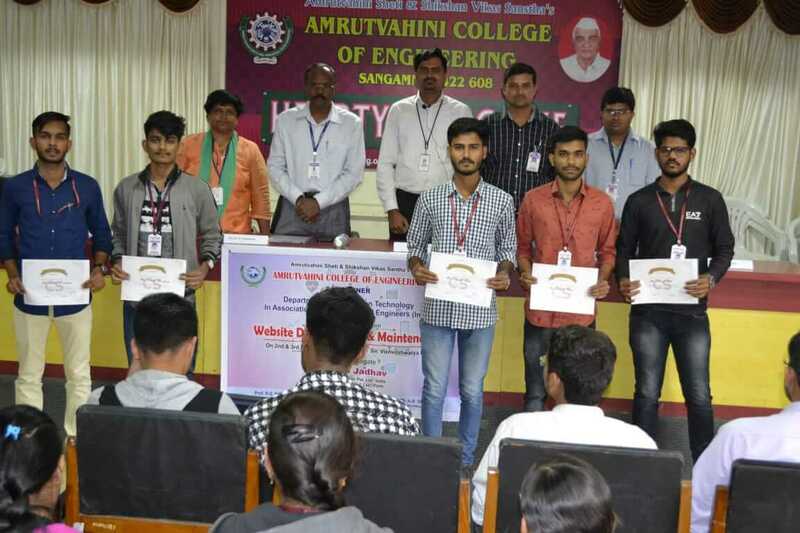 Amrutvahini College of Engineering,Sangamner. 02 Ms. Jagtap Vaishali Information Technology ME(I.T.) 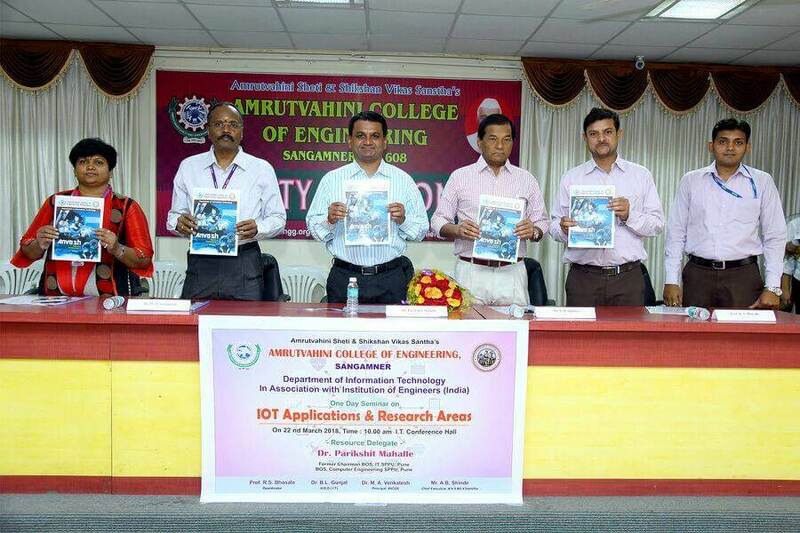 Amrutvahini College of Engineering,Sangamner. 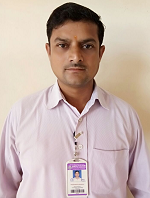 03 Mr. Navnath Wagh Information Technology ME(I.T.) 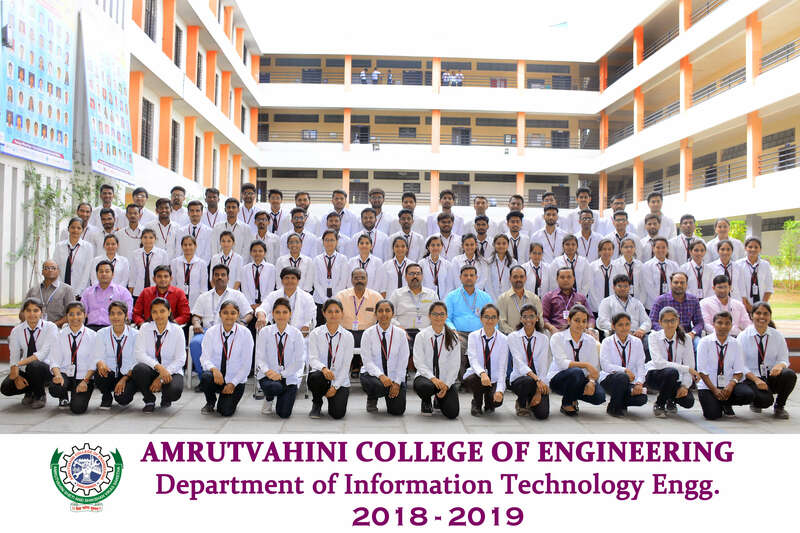 Amrutvahini College of Engineering,Sangamner. To strive hard for high academic excellence through continual efforts for enhancement in teaching-learning process. To enhance placements by strong interactions with reputed industries. To inculcate recent trends in I.T. field through interactions with experts of IITs and foreign universities. To strive hard to enhance team building and communication skills of students through curricular, co-curricular and extracurricular activities. 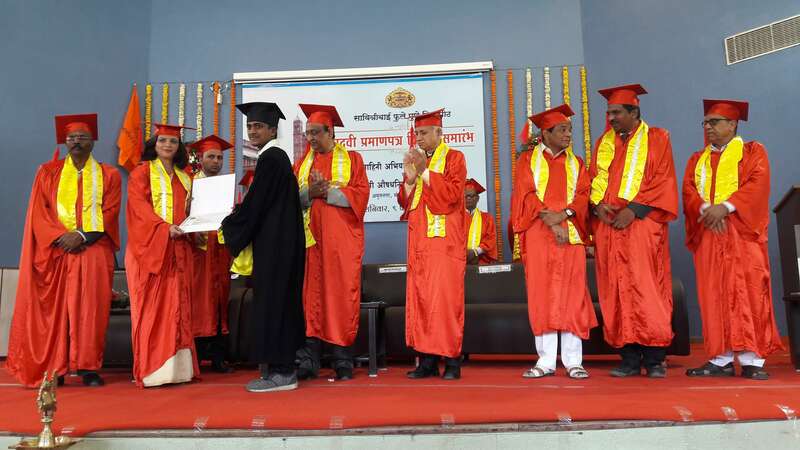 To groom students with awareness of social, ethical, moral values along with legal, health, safety through social as well as techno-social activities. After successful completion of UG course in Information Technology, the students will attain following PSOs. Ability to apply decision-making skills through the use of appropriate technology with ability of lifelong learning in industry culture. 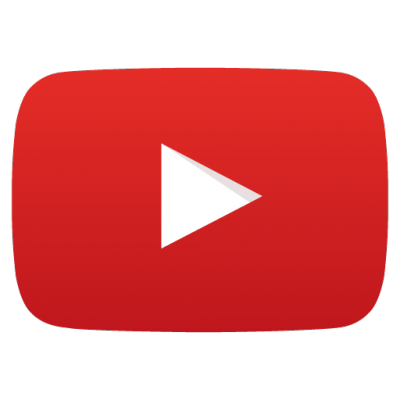 Ability to apply Problem solving skills on open source platform with open source softwares and tools for designing and developing I.T. solution to real world problems. Ability to apply professional skills of fundamentals of mathematics, applied algorithms, Software Engineering, System programming, web designing, Networking, Cloud computing, Big Data Analytics, theory of computations, Cyber security in I.T.based systems. An ability to understand professional, social, ethical and moral responsibilities along with health, safety, legal and cultural issues for betterment of mankind. 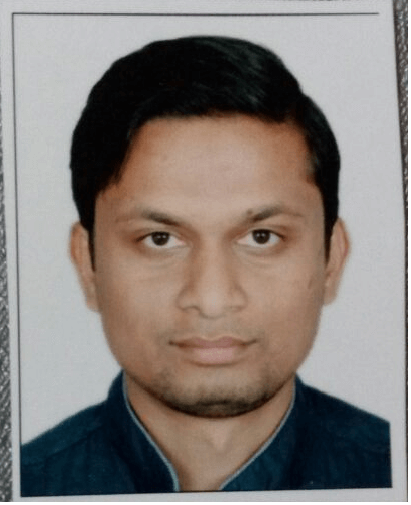 Sr.Software Engineer at TOYO Engineering India LTD. Sales tax inspector at government of Maharashtra. 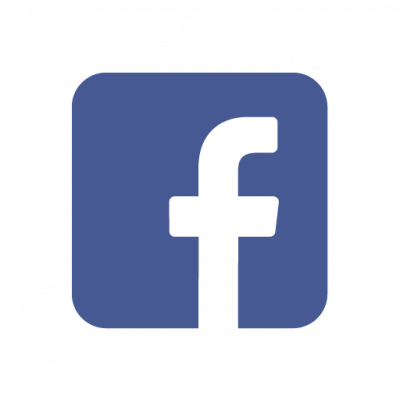 Technology Analyst at Infosys Pune. Sr. Software Engineer at Wipro Technology, Mumbai.